Learn the ins and outs of the Millennium Falcon, and then build your own foam model. When built, the model measures 12″ x 12″. Available on Amazon in “hard” paperback. You can find it at other online and offline booksellers, as well. You have to admit that Disney is an amazing marketing machine. What kid (or kid in an adult’s body) wouldn’t love to have a model of the Millennium Falcon proudly displayed on their mantle? In fact, years, ago I assembled one of those 3D puzzles of the Millennium Falcon, resulting in an almost 3-foot wide model. That monstrosity was just too hard to move from home to home, so it had to go. However, this model is a much more manageable size, and from the looks of it, probably a lot more sturdy. My inner child went bonkers when I received this book! How cool it looked and all the pictures from my favorite childhood movie (yep, I’m dating myself). I was 10 years old when the Millennium Falcon first flew into my imagination, and it never left. 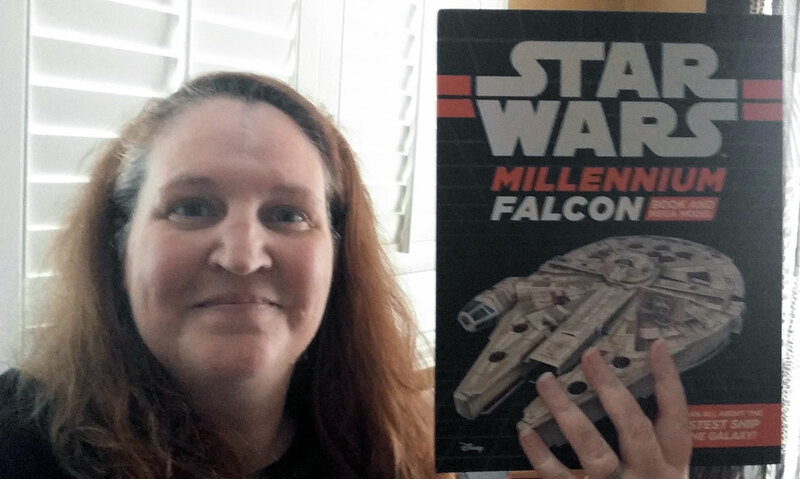 This book and model kit will let adults relive those memories and help parents share their Star Wars fandom with the next generation. These are nit-pics, but I think I should mention them anyway. 1. Amazon lists this as a paperback. Not really. This is a hardcover book, but not as archivable as most hardcover books. 2. Because the model is a part of the book, it can be easy to damage the book. And removing the parts without destroying them will take a deft hand (and perhaps a X Acto knife?). This will make an excellent Christmas gift for the young Han Solo and Star Wars fan on your list. But I recommend parental guidance for younger readers so they won’t be disappointed with poor results when assembling the model.